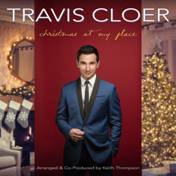 JERSEY BOYS star Travis Cloer sets the tone for the holidays with the debut of his completely new, fully orchestrated holiday album, ?Christmas at My Place,? on Tuesday, November 3. The album is going to be available to buy on iTunes along with other music platforms for $11.99 that Tuesday. A unique CD release party follows on Monday, November 9 in the Foundation Room at Mandalay Bay. Announced ?One of Vegas? most accomplished showmen,? Cloer?s album will mix holiday standards with never-before-heard tracks, including original tunes ?Christmas is My Favorite? and ? (Baby, It?s Cold) Underneath the Mistletoe.? Featuring completely new plans with swinging horns, lush strings and special visitors, ?Christmas inside my Place? offers the perfect musical mood for that giving season. The album features collaborations with JERSEY BOYS cast people Lauren Guivas, Sarah Lowe, Nikka Wahl and conductor Keith Thompson, Vegas artist Niki Scalera, people of Broadway within the Hood yet others. Fans and buddies are asked to join Cloer for a special release party on Monday, November 9 from 6-9 p.m. in the Foundation Room at Mandalay Bay. Visitors may have the chance to hear ?Christmas at My Place,? sip on libations and revel in a night full of holiday cheer. A portion of the proceeds from the night goes toward HELP of S. Nevada to supply gifts to local families and non-profit agencies in need of assistance this holidays. Following the prosperity of his sold-out holiday performances in the Cruz Center?s Cabaret Jazz, Cloer is happy to release ?Christmas at My Place? and then share his passion for the holiday season.